31302 Size: 30"W Features: -Has built in safety rails. -Constructed from aircraft-quality aluminum. -Includes a yellow plastic caution cover. -Tools included for installation. 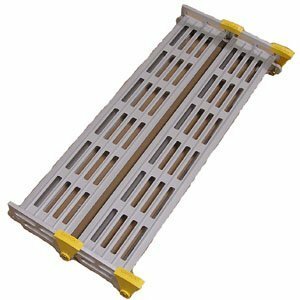 Product Type: -Roll up ramp/Ramp accessories. Primary Material: -Metal. Number of Items Included: -3. Outdoor Use: -Yes. Country of Manufacture: -United States. Dimensions: Overall Ramp Length - Front to Back: -1 Feet. Size 36"W - Overall Width - Side to Side: -36". Size 30"W - Overall Width - Side to Side: -30". Size 26" W - Overall Width - Side to Side: -26". Size 12" W - Overall Width - Side to Side: -12".